Tens of millions of IP addresses were used to take down popular websites like Twitter and Netflix as part of a massive cyberattack on Friday. Dyn, an Internet middleman company, was the target of the distributed denial-of-service, or DDoS, attack that hit in three waves. Dyn directs traffic when people type a URL into a browser. So the attack on the company caused temporary outages at many of the internet's most widely-trafficked sites. On Saturday, Dyn revealed that a "sophisticated" attack involved "10s of millions of IP addresses." 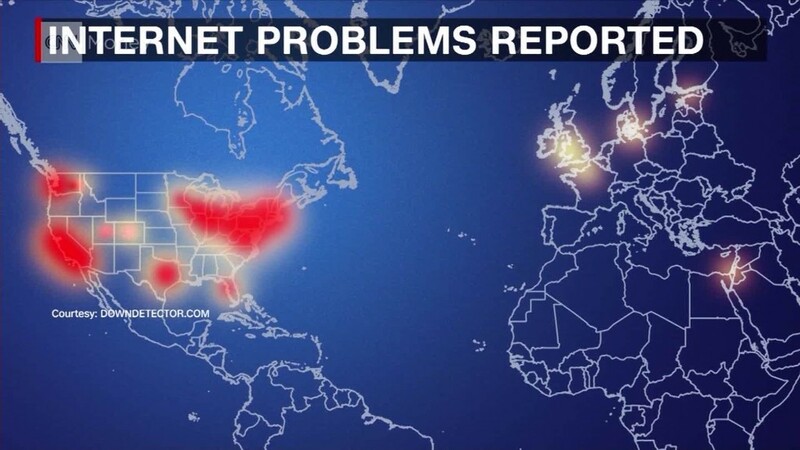 The outages were caused, at least in part, by malware sent by hackers to devices connected to the internet. "The sheer volume and consistency of these attacks was unprecedented," said Dyn's chief security officer Kyle York. "We run 18 data centers globally and it was hitting all of them at different and unique times." Dyn said it is continuing its investigation into the root cause. Software IT company Dynatrace monitors more than 150 websites -- it found that 77 were affected on Friday. The disruption may have lost companies up to $110 million in revenue and sales, according to CEO John van Siclen. Linux Systems analyst Hayden James said the impact of the cyberattack on businesses can be significant. "Even though its not a physical bomb, it has some similar effects," James told CNNMoney, citing the loss in business and advertising revenue. While James said he believes this to be the worst DDoS attack in recent memory, future attacks could last longer and cripple the U.S., like one that impacts trains or the stock market. "There's a strong possibility of far more sophisticated attacks that could shut down the entire internet for everyone for hours, if not an entire day," added James. -- CNN's Jim Sciutto and Samuel Burke contributed reporting.